TGO-C 2016 Crossing Scotland Glen Shiel to Skurdieness. Tuesday 10th May, 2 days to go. Second, third and fourth thoughts. Marian’s shoulder (operation only last January) is now compounded by a very sore knee. I need a bigger pack to take some of her weight. Have always been a believer that a small pack is the first line of discipline to going light. 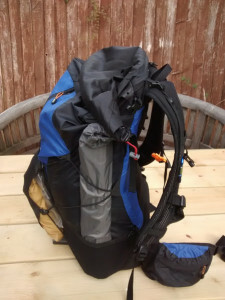 So have always used a proto’ pack I made, less than 40L which has no flap, weighing only 950g. Great, but no spare room left to carry extra! 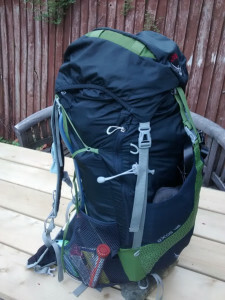 Switched to a 50L Osprey weight 1150g. Complete rethink of how to pack with this totally different configuration, there are so many pockets, will I recall where I have put stuff or panic thinking have left something? We debated shifting back to a lighter tent, but backed off, the extra comfort room is worthwhile. Final check weighing of packs, with tent, sleeping bags, cameras, food for 3 days but excluding normal layers we are wearing as we leave home. Me 9.8kg, Marian 7.8kg. fine tuning to this was a lot of time and effort, days of comparing notes and updating my XL.